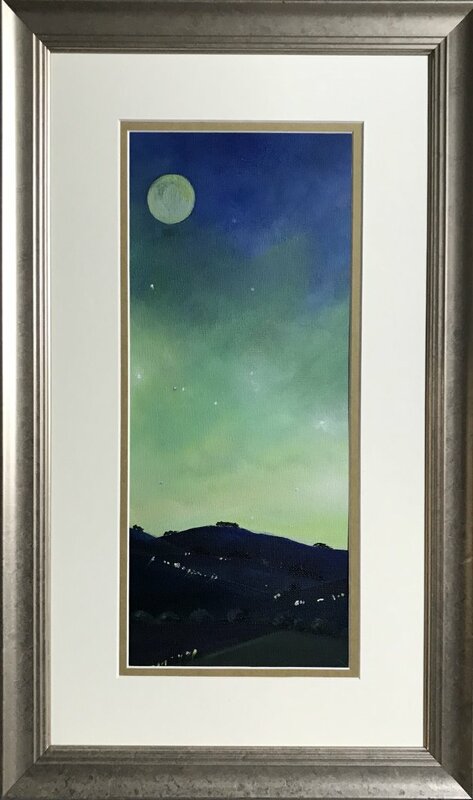 Spring moon at twilight The giant spring equinox moon rises in spledour across the early evening sky An original oil painting on canvas signed by Sarah Gill . Presented in a brushed silver frame, and double cream mount, under glass - ready to hang. As twilight descends over the hills and dales of the Peak District the stars and moon sparkle in the aqua sky. The overall dimension of the artwork is 12 x 20 inches . The actual artwork within the mount measures 5.5 x 13.5 inches.